The AMMM – this is short for Amazing Mini Music Machine (and affectionately called the AMMM!). 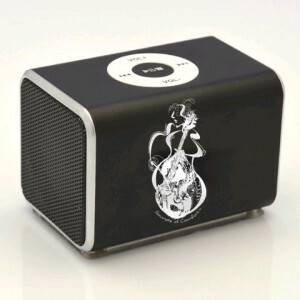 A hand-held mini speaker, it comes with a flash drive that is pre-loaded with 5 hours of beautiful harp music. Click here for additional information. 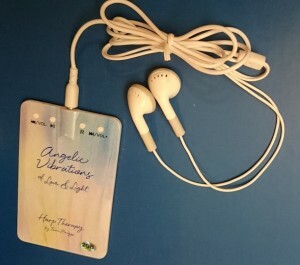 Angelic Vibrations – the size of a credit card, this MP3 player is pre-loaded with 4 hours of Tami Briggs’ harp music. It comes with ear buds and easy-to-use instructions. And self-contained in a small plastic box! Find more information by clicking here. While our harp CDs and downloads are not music gadgets, they are also available! We have 13 CDs and 150 songs to download/select from. If you need more information on any of this, please feel free to call us at 952-829-1919. We are happy to facilitate getting perfect, unique holiday gifts for your loved ones on your Christmas shopping list! Music is an art that expresses the inexpressible.